This splitter alouds the PWM signal input from the mainboard to control up to max. 4 GELID PWM fans. Connect 4 PWM fans to your mainboard's CPU socket with direct power supply from PSU. 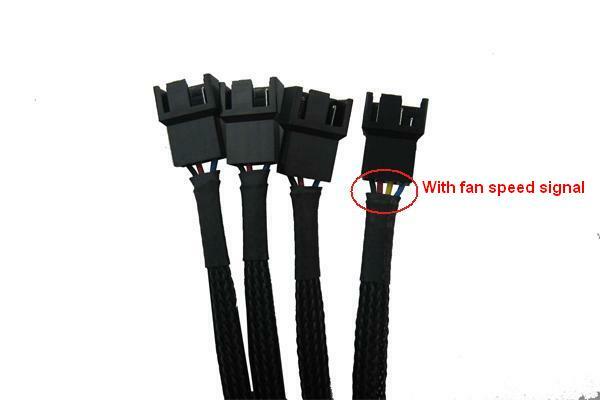 Use multiple PWM splitter to connect 4 PWM fans and provide additional cooling as before. While PWM fan controllers are very common in today's PC industry and available on most mainboards, there is often only one or two such PWM headers, reserved for the CPU and or the chipset fans. One way this excellent noise reduction idea can be extended to the numerous case fans inside a typical PC is by utilizing a GELID PWM splitter. The splitter provides a length of 420mm.